We strive to be the service provider of your fine auto. 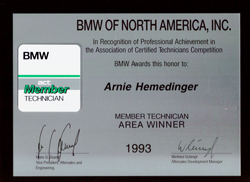 Our goal is to diagnose the vehicle in a timely manner and to provide you with a fair estimate. Our quality control standards are high, our technicians are among the best in the business and so are the diagnostic tools we utilize. Our goal is to make sure your vehicle leaves our facility in a better condition than when it arrived. We want you, our valued customer, to be happy. We are definitely the cost-effective alternative to car dealership servicing for all scheduled maintenance of your personal or company auto. Regardless of where it was built, we will service your vehicle and still maintain the manufacturer's warranty. 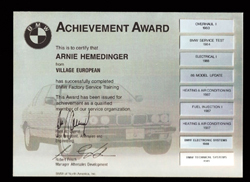 Alpine Auto Werkstatt is independently owned and operated. We pride ourselves on getting the services or repairs on your vehicle right the first time, by our highly qualified service technicians. We offer quality repairs to your vehicle, with a bright clean and well maintained waiting area, current publications, free WiFi and a mini hospitality center to serve you.